CAPTION: Mr. Bill Godfrey, Building Trades Instructor at Putnam County High School was presented the Outstanding Educator Award on Friday, May 9, at the Putnam County High School Awards Assembly by Marla Harrington. Four years ago, Grand River Technical School began a tradition of honoring an outstanding educator from an area high school with our focus being on someone who always does what is best for students and works closely with our staff to help those students advance their career goals. It is our privilege to present the award this year to a Putnam County educator. Each year, we at Grand River Tech are excited to have several Putnam Co students enroll in our post-secondary technical programs and for next year, we have five! We are always honored to enroll Putnam Co students because they have proven to be hard workers, dependable, polite and ambitious. And I think it is appropriate to give credit to the Putnam Co school district, and one individual in particular for the success of your graduates. Numerous Putnam Co graduates have attended GRTS. Those students are now in exciting careers in fields such as Collision Repair, Auto Service, Industrial Maintenance, Welding, Building Trades, Diesel Technology and Emergency Medical Services. Many of our instructors and employers who hire our graduates have commented often as to the quality of the students from Putnam Co.
And.. nearly every Putnam Co student we have had over the years have told us things like "Mr. Godfrey told me about your school" or "Mr. Godfrey said I should check out your programs” or “Mr. Godfrey is bringing me down for a tour". Mr. Godfrey is responsible for bringing many, many students to our tech school, serving a role of teacher, mentor and counselor, going beyond his classroom and shop to help students set career goals and see them through. 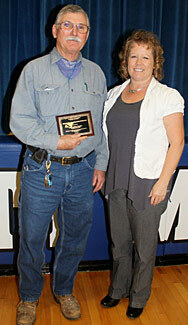 We are proud to present the Grand River Tech School Outstanding Educator Award to Mr. Bill Godfrey.